12 days of Giving 70% OFF SALES - Nov 7-18th Check Daily for new deal ! It is phenomenal line of bags and jewelry ... can't wait to show you guys! 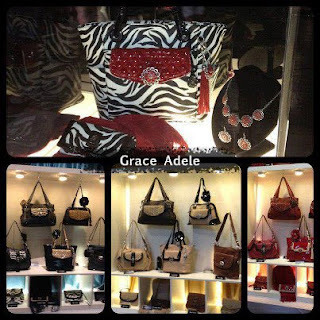 Follow five simple steps to create your perfect look with Grace Adele. 1. Pick My Bag Color: from glam purple to zebra striped, discover the color that suits you best. 2. Choose My Bag: Choose from beautiful bags that will anchor your style and organize your must-haves. 3. Add My Clutch: This is where it gets really fun! select a clutch - or two or three - to adorn your bag. Slide the clutch into the outer pocket on your bag and style you own look. 4. Style My Bag: add a little flair and organize your essentials with clip-ons, then fill your bag with accessories so you can find what you need in a pinch. 5. Style Me: elevate your look with signature jewelry and scarves. In every Grace Adele bag is an Intelligent Interior™ that’s stylish and smart, with specially designed pockets to hold everything you need to take on the day — including your Grace Adele wallet, notebook, makeup bag, clutch — with plenty of room to spare. Keep your must-haves on hand and easy to find in a pinch. Wanna sign up to sell it? Click here!